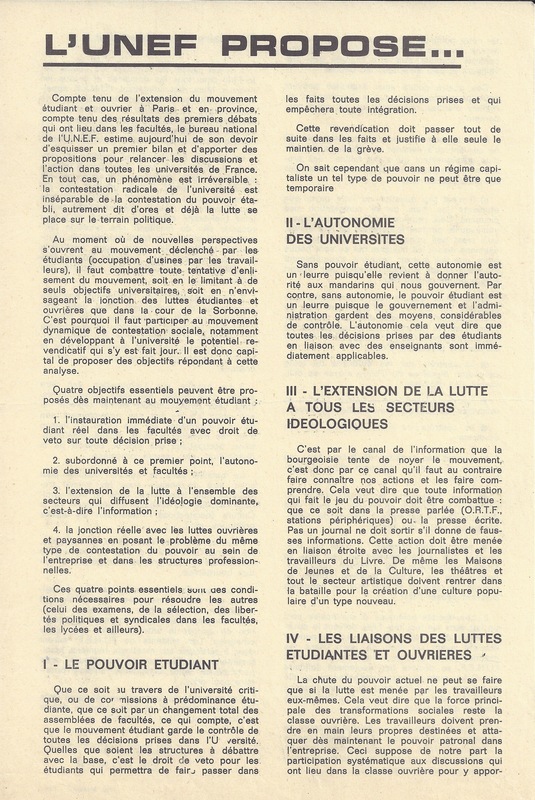 Considering the extension of the student and workers’ movement in Paris and the provinces, together with the outcome of preliminary discussions which have been taking place in the faculties, the UNEP national executive (national bureau) considers it to be its duty to sketch out a preliminary balance-sheet of events and to put forward some ideas for restarting discussions and action in all French universities. At all events, one thing is clear: the radical dispute going on within the university is inseparable from the challenge to the established power structure, in other words, the battle is currently taking on a political nature. At a time when the movement started by students is taking on a new perspective (factory occupations by workers), it is vital that we overcome any attempt to smother the movement, either by limiting its aims to purely university matters or by considering unity do be possible only in the forecourt of the Sorbonne. This is why it is so important for us to participate in the dynamic movement of social confrontation, chiefly by developing in the universities a potential for assertive demands. It is vital to put forward suggestions complying with this analysis. 4. The real unification of workers and peasants causes by bringing up the same sort of confrontation with authority in the factories. These four vital factors will create the conditions necessary for solving other problems (exams, selection, political and trade-union freedom in faculties, schools and elsewhere). Whether it is by means of the Critical University, or by predominantly student committees or by a complete transformation of faculty meetings, what is important is that the student movement retains control over all decisions made in the University. Whatever structures are discussed at local level, it is the students right of veto which will allow decisions to become fact and prevent integration. This measure must come into effect immediately, it alone justifies the continuation of the strike. We all know, however, that in a capitalist regime such power can only be temporary. Without student power, the autonomy of the university would be a mere trap. giving authority back do the university mandarins. On the other hand, without autonomy student power is a trap, since the government and administration retain the means of control. Autonomy means that all decisions taken by students in collaboration with the staff will come into effect immediately. It is by means of the media that the bourgeoisie is trying to destroy the movement, so it is by this means that we must publicise our actions and make them understood. This means that any source of information that toes the governments line must be fought whether it be the ORTF, private radio stations or the press. Not one paper must appear if it gives false information. We must act in close communication with journalists and printing workers. In the same way, youth and cultural centres, theatres and all artistic professions must join the struggle for the creation of a new people’s culture. The downfall of the present ruling power can only occur if the battle is led by the workers themselves. This means that the main strength behind changes in society remains the working class. Workers must take their futures into their own hands and fight against the power of management in business. For our part, this implies systematic participation in the discussions taking place in the working class – in order to present out point of view, and not to give lessons, Also, every university under student control should be open to workers, and in all discussions. a) There is no question of victimising students for challenging the exams. This means it is inconceivable that the students should lose a year, nor that the militants who fought while others stayed at home, or who were wounded should suffer. – the baccalauréat: it is no longer feasible for the exam to continue under its present form. At the very least, we advocate that school students have the power of control and that all candidates have the right to take the oral exam. 2. Political and trade-union freedoms are a fact in the faculties. 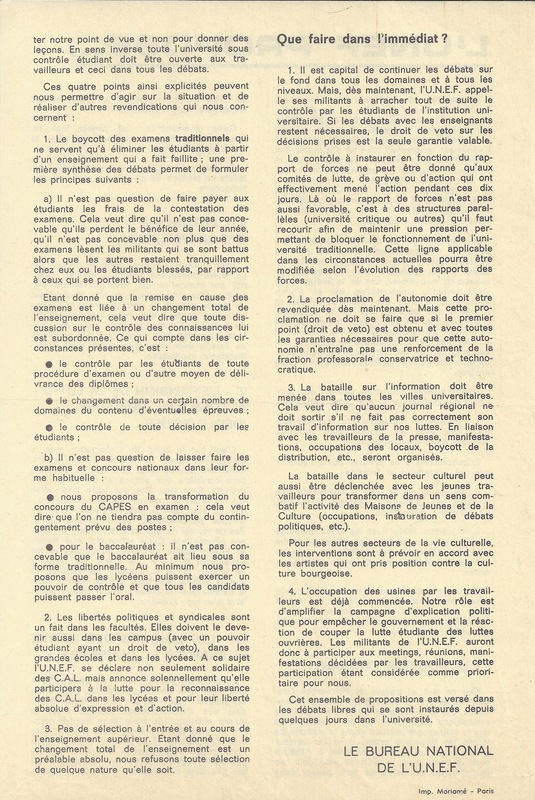 They should also become so (student power having the right of veto) in the grandes écoles and secondary schools, UNEF declares itself in solidarity with the CAL on this point, and will support and participate in the struggle for recognition for the CAL in schools and for their complete freedom of action and expression. 3. No selection at entry and throughout higher education. Given that a complete change in education is a primary objective, we declare ourselves against any form of selection. 1. It is essential to continue discussion of fundamental issues in every domain and on every level. But from now on, the UNEF calls on its militants immediately to seize control of university institutions. If discussions with the teachers remain necessary, the right of veto on all decisions taken is the only valid guarantee. The control to be set up in terms of relative strength can only be given to the combat, strike, or action committees that have actually led the action during these last ten days. Wherever the relative strength is not favourable we must have recourse to parallel structures (the counter university or others) in order to maintain pressure that would make it possible to obstruct the functioning of the traditional University. This line, which is applicable under present circumstances, can be altered according to the evolution of our relative strength. 2. Proclamation of autonomy must be demanded now. But this proclamation must be made only if the first point (right of veto) has been obtained, and with all the necessary guarantees that this autonomy will not bring about a reinforcement of the conservative and technocratic professional fraction. 3. The mass media battle must be waged in every university city. This means that no regional newspaper can come out if it has not accurately presented information concerning our struggle, demonstrations, occupation of premises, boycott of distribution, etc., will be organised in collaboration with newspaper workers. The battle in the cultural sector can also be waged with young workers in order to orient the activity of youth and cultural centres toward combat (occupations, organisation of political discussions, etc.). As regards other sectors of cultural life, participation will take place in agreement with artists who have taken a stand against bourgeois culture. 4. Occupation of factories by the workers has already begun. Our role is to broaden the campaign of political explanation to prevent the government and the reactionaries from separating the student and worker struggles. The UNEP militants will therefore take part in the meetings, assemblies, and demonstrations decided upon by the workers, this participation being considered by us as a priority. This series of proposals has been introduced into the free discussions that have been going on for several days now in the university.